Another Canadian winery has joined the Pinotage family. The View Winery in Canada's Okanagan Valley wine region is about to release their second vintage, the 2008 Red Shoe Pinotage. "Our first release, Pinotage 2007, is a delicate medium bodied red. It is lightly oaked and is quite fruit forward with cherry aromas and flavours. We produced 260 cases," says Jennifer Turton-Molgat. "Pinotage 2008 has quite a different profile - an extended maceration compared to that of the 2007 has achieved a much fuller bodied, complex Pinotage. The peppery spiciness of the Cinsaut shows itself in this vintage. It was aged for 12 months in a combination of Hungarian, French and American oak barrels." The View Winery will be bottling it in the middle of March and producing approximately 585 cases. They have four acres of Pinotage ranging in age from 8 - 10 years. Jennifer tells me "the vines are thriving on our property. The early ripening nature of Pinotage appears to suit our climate and location and we are excited to be planting another five acres in the spring. One message from Friday’s Pinotage Party, organised by Dezel of My Vine Spot, in Virginia, is that participants in the USA had difficulty in finding Pinotage. Veronica Castella of in Tampa, Florida went to five wine stores and found only one bottle of Nederburg ‘Winemakers Reserve’ 2007. “It was the only one in town. There was not even a second bottle. There were no other Pinotages at all anywhere,” she told me. Veronica and three colleagues tasted the wine blind against a California Pinot Noir costing twice as much and the Pinotage did pretty well, being the favourite of one taster. See the video of the tasting here. Tanisha of the grapevine4wine.blogspot.com in Washington DC opened Golden Kaan 2007 which she found “amazing” with food. Ben from Vintology Wine Blog in west Texas chose Fleur Du Cap 2007 which he “kind of enjoyed it overall” although its smell reminded him of “ham”. winemakers, as this held up beautifully - long after their recommended aging length”)and Hill & Dale 2007 (“Brilliant”) from South Africa, and Marcus James Pinotage 2007 (“Simply quite terrible”) from Brazil. Sue Courtney at New Zealand's WineoftheWeek.com opened Kerr Farm Kumeu Pinotage 2004 from Auckland and said "a fascinating wine, it's changing in the glass as we sip it - and it reconfirms why I like this intriguing, funky and always interesting variety called Pinotage." Dezel himself tried Spier 'Private Collection' 2006 which he found "mouth-filling and ripe". I thought he'd be tasting a Virginia Pinotage! Many thanks to Dezel for organising this. 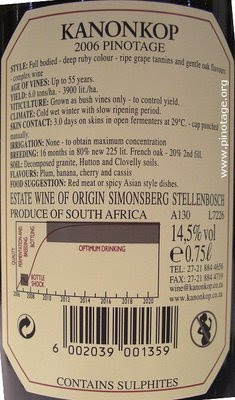 Beyerskloof Pinotage 2008 with its white label is the standard bottling from Pinotage king Beyers Truter's winery. The 2008 example is just delicious with bags of ripe blackberry and strawberry fruit and soft tannins on the finish. This one is lovely to drink on its own and it makes a cracking match with a takeaway from the Indian restaurant. I love this wine for its sheer drinkability. It is classic Pinotage. 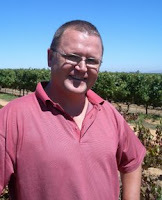 Kanonkop Estate is probably the most famous Pinotage producer internationally. From the time they started bottling their own wines more than forty years ago they have specialised in only a few wines and varieties of which Pinotage is one. They were among the first to plant the variety and now have one of the oldest Pinotage vineyards planted with sixty-year old gnarled stubby bush vines on a low clay hill. 2006 was a good vintage. I first tasted this at the winery on release in March 2007 and I was delighted with it. In June 2008 I said it was “showing all the signs of being another cracker. It is elegant, showing restrained berry fruits, balanced by tannins and fruit acids,” and I purchased a couple of cases intending to age them. Opening this bottle for Dezels’s Pinotage Party I was struck first by its inviting mulberry bouquet. But on the palate is seemed to have closed up. The spicy berry flavours, so noticeable when it was young, were subdued. What we had here was a medium bodied, well balanced beautifully coloured restrained tight wine, enjoyable and serious but not as exuberant as I’d like. The maturation chart on the back label (see below) shows 2010 as the year it should reach optimum drinking, but I think I’ll age it more for maximum enjoyment.